Lieutenant (Lt) Gilbert Donnelly (copyright Donnelly family) - Captain (Capt) John Forsythe Harvey (copyright The Royal Inniskilling Fusiliers Museum). 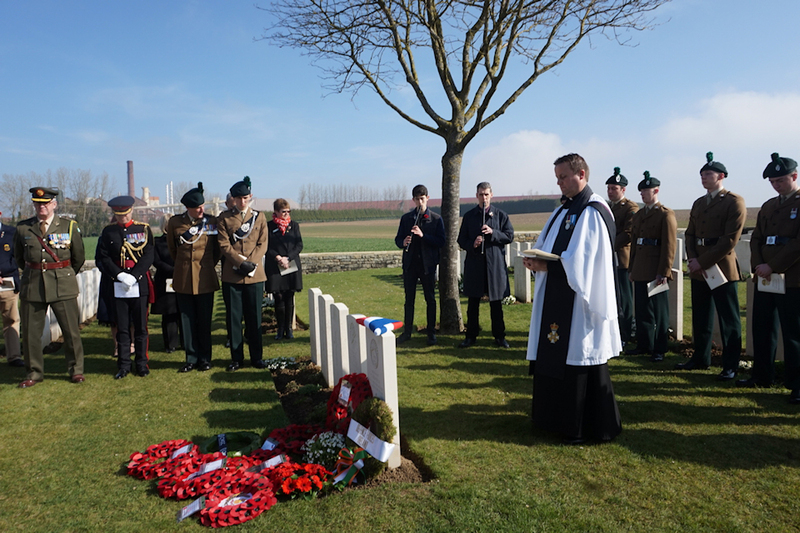 The services, organised by the MOD’s Joint Casualty and Compassionate Centre (JCCC), part of Defence Business Services (DBS), were conducted by the Reverend Nathan King CF, Chaplain to 1st Battalion The Royal Irish Regiment and were attended by ten members of The Royal Irish Regiment. The Reverend Nathan King conducts the rededication service for Lieutenant Donnelly. MOD Crown Copyright. It has been an honour to organise these rededication services for two Irish Officers who are still much loved by their families. The memory of their sacrifices has been kept alive throughout the generations. It is rewarding to know that these men have been found and that their families are now able to visit their final resting places for generations to come. The rededication service at Ste. Emilie Valley Cemetery was attended by twenty-five members of Lt Donnelly’s family. Lt Donnelly’s great nephew, Dan Donnelly, was pivotal in finding him, having submitted his research regarding his final resting place. We know Gilbert’s father and siblings were left bereft at news of his loss and that they had tried to find out the details and whereabouts of his death. We are therefore delighted to gather on their behalf and remember this brave young man who voluntarily left the comfort of home for the horror of war. The location of Capt Harvey’s grave was identified by the historian Michael Nugent. The JCCC and the National Army Museum (NAM) corroborated his research which confirmed the identification of the grave. 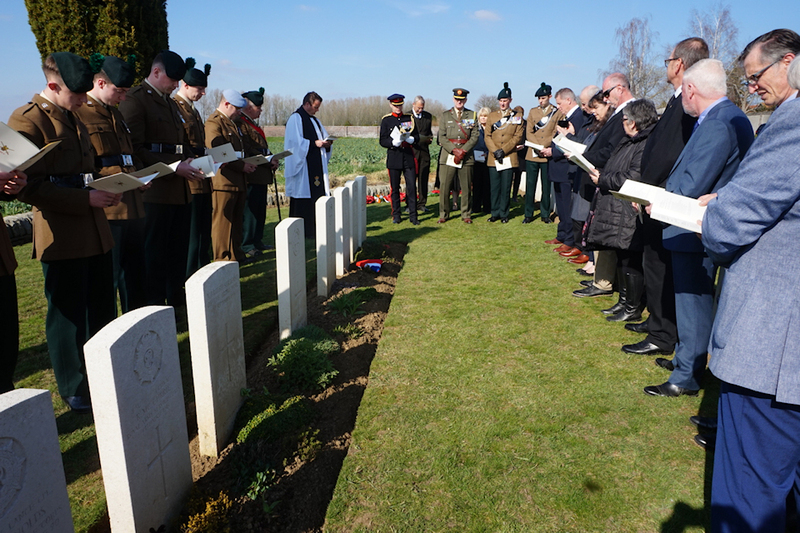 The rededication service at Noyon New British Cemetery was attended by eight members of Capt Harvey’s family. As we grew up our grandmother’s brother John Harvey’s death in WW1 was often talked about and there was always an added sadness that he had no known grave. So as a family now over 100 years later we are very grateful Michael Nugent’s research for his book has identified his grave and the JCCC have involved us in the rededication service. We feel very privileged to be able to represent the family at this Rededication ensuring Cpt. John Forsythe Harvey’s memory and resting place is assured for future generations. Members of The Royal Irish Regiment and the family of Captain Harvey look on during the rededication service at Noyon New British Cemetery. MOD Crown Copyright. Lieutenant Gilbert Donnelly Upon receipt of Mr Donnelly’s research further investigations were undertaken by the JCCC and NAM to corroborate the submitted evidence and the identification of the ‘Unknown Soldier’ grave was finally confirmed. Lt Donnelly, aged 20, was serving with 1st Battalion The Royal Munster Fusiliers, when he was killed at Sainte Emilie on 21 March 1918, the first day of the German Spring Offence. Before he was Commissioned, Lt Donnelly had been studying medicine at Queen’s University, Belfast. He fought at the Battle of Messines, the Third Battle of Ypres (Passchendaele) and at the Battle of Cambrai. On 21 March 1918, Lt Donnelly was acting as a “spotter” for a Lewis machine gun crew near the village of Sainte Emilie, when he was killed by a sniper. Listed as missing, Lt Donnelly is commemorated on the Poziéres Memorial (a WW1 Memorial, located near the commune of Poziéres, in the Somme department of France). 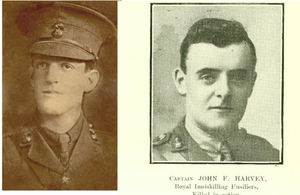 Captain John Forsythe Harvey Capt Harvey from Castlereagh, County Down, was serving with 9th Battalion The Royal Inniskilling Fusiliers when he was killed on 23 March 1918, aged 23. Before he was Commissioned in July 1916, Capt Harvey had worked in the Linen Trade in Belfast. Capt Harvey was killed during heavy fighting near the village of Brouchy, south west of Saint-Quentin, and was buried in Brouchy Churchyard. In 1934 his remains were reinterred in Noyon New British Cemetery where he was buried as an unknown Captain. He is also commemorated on the Poziéres Memorial. By such acts of rededication, we remember again and renew our thoughts about those who have passed and are known not only to God but also to family members past and present. We are reminded again of the great sacrifices made and recognise in them the courageousness of the human spirit. There is an important spiritual element to such remembrance with a sense held in the Christian faith that the souls of the faithful rest in the presence of God and that peace has been found. Two new headstones bearing the names of Lt Donnelly and Capt Harvey have been provided by the CWGC, who will now care for their final resting places in perpetuity. The headstones now bear the names and personal inscriptions chosen by the respective families on behalf of those who loved them a century ago. Brigadier Mike Murdoch, Deputy Colonel of The Royal Irish Regiment, presents a Union Flag to the family of Captain Harvey. MOD Crown Copyright. Although Lieutenant Gilbert Donnelly was buried in Ste. Emilie Valley Cemetery and Captain John Forsythe Harvey in Noyon New British Cemetery after the war it was not possible to identify them, and for almost a century their names have been recorded on the Pozieres Memorial to the Missing. 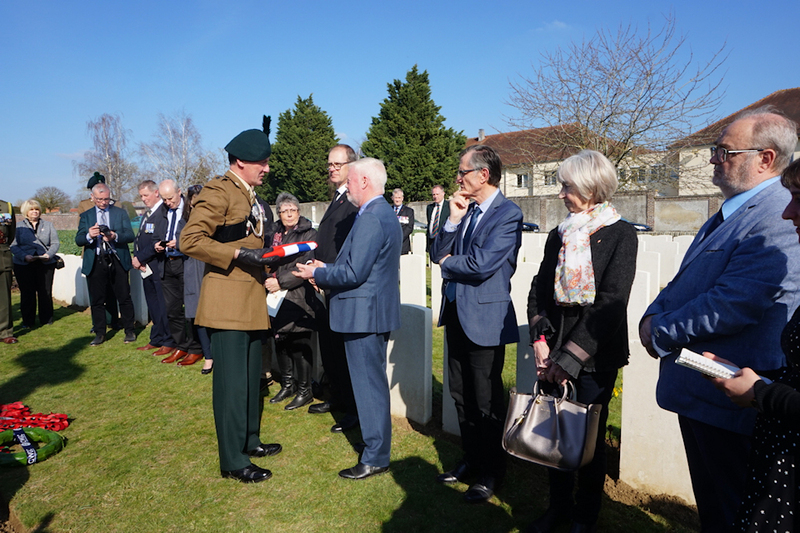 Today, thanks to the efforts of many and in the presence of their respective families, we are able to rededicate their graves with new headstones and renew the commitment of the Commonwealth War Graves Commission to care for them, forever.